ok here's the story this was a customer returned because of that bents in the pipe as you can see at the picture how bad it is but we are still wondering why it got damaged since the box was fine and has no sign of damaged so my boss was gonna throw it away and i asked them if i can buy it for cheap but instead of selling it to me he just gave it to me i was so happy with a big smile im my face LOL. so my question now i wanna know if there's any way to fix that bents? LOL i work at auto parts dealership so sometimes when we get rejects mostly we just throw them away, what a waste right. I'll see if my mechanic can do something to fix it also i was thinking heating it but i don;t want to damaged the paint. I also want to know if it also necessary to remove the stock intake resonator before i install it? 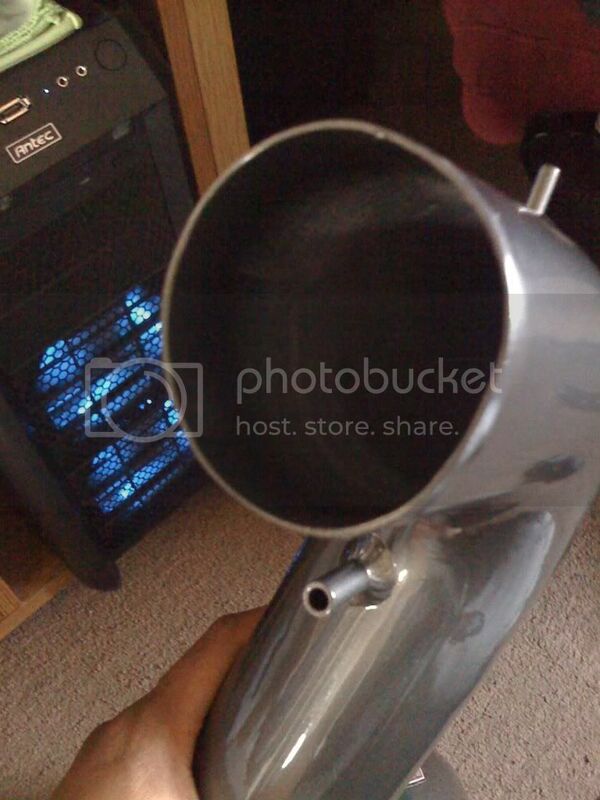 right now i'm using and ebay intake pipe with aem filter. nah its just goes on so to speak. its ok if u ruin the paint there cause the filter will cover it. i had to get my intake cut cause it was too long. the way i have my ballasts bolted it caused the filter not to fit so well. but dont worry ur golden. an exhaust shop would have a pipe bender that has a flang on it to expand exhause pipes to make them slightly bigger at the ends. I use one quite frequently. I can see them using it to just round out the tip. Exactly what i was going to say do. oh ok. i went to my mechanic today but they said they cannot fix it. i'll try to look for exhaust shop on tuesday. machine shop. muffler shop. he knew what i meant im sure lol. i just fixed it myself b/c i can;t wait until tomorrow.. LOL well its holiday today so mind as well use my time to fix it. i used a fliers and a rubber hammer it came out well but it leave some scratches but its not a big deal due the filter cover it anyway. here's the pictures of intake and couple of my engine bay. i also have to remove the resonator because of the solenoid is in the way. gj fixing it, lucky man u got it for free...btw what headlights you got on? now that i can see the inside of the AEM intake(which i've been wantin to see for a while). wat is the purpose of the bigger section of it if its really the same size as the rest of the pipe, does it have a purpose or is it just aesthetic? Nice, you got a $300 intake for free lol.